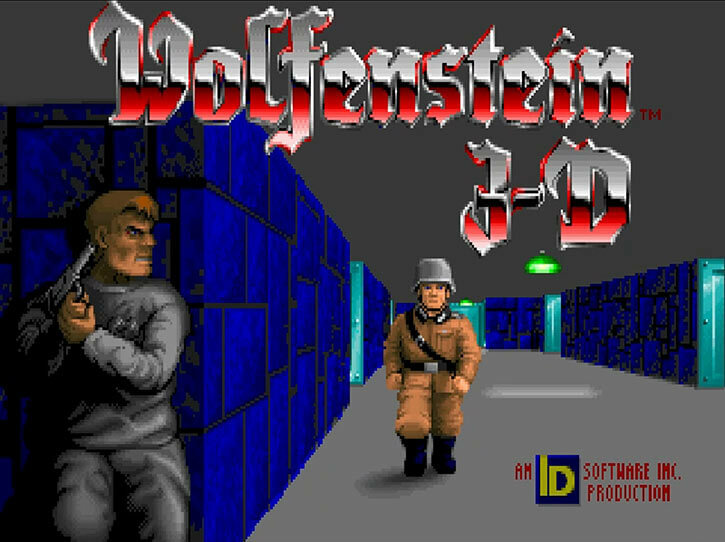 Wolfenstein 3D was a landmark computer game, released all the way back in 1992. It is often considered the grand-daddy of First-Person Shooter games, though Ultima Underworld should also be mentioned. 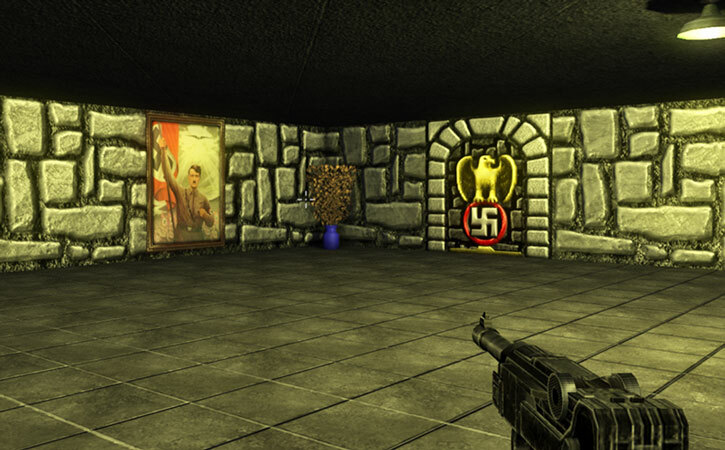 Wolfenstein takes place during World War Two and follows a lone allied agent exploring Nazi fortresses. However, it soon becomes apparent that Nazis are in league with demonic forces – who also provide them with futuristic weapons. Can one commando prevail against such odds ? Real Name: William J. ”B.J.” Blazkowicz. Known Relatives: None, but see the “Family Biczness” section. Group Affiliation: Agent for the Allied military intelligence. The protagonists of the older ID Software games, including B.J. Blazkowicz, are related. This isn’t a story point – the games barely have a story, and the mentions of a relation came years later. But it could play a role in a campaign drawing from those games. Boy genius Billy Blaze is reputedly the grandson of B.J. Blazkowicz. This eight-year old ventured to Mars and other planets, wearing a football helmet to assume the identity of “Commander Keen ”. This is a super-hero he made up – much like Calvin pretending to be Spaceman Spiff, except that Keen’s skills and equipment are real. Usually outfitted with a pogo stick and ray gun, Commander Keen had many adventures. For what it’s worth, Commander Keen is also mentioned in the early Duke Nukem material, back when it was a side-scroller game. The 2005 DooM RPG cellphone game implies that protagonist “Doomguy” is the same person in all three DooM games. He might be named B.J. Blazkowicz III. Or maybe Sgt. Stan Blazkowicz. This is not mentioned elsewhere, and contradicted by the novels. This Blazkowicz person might be the son of Billy Blaze. That would imply reverting to the old Polish version of their last name rather than the anglicized version adopted by Blaze’s father. The Wolfenstein RPG cellphone game has its version of B.J. Blazkowicz encounter a demon looking just like the Cyberdemon from DooM II. This creature, Harbinger , claims it will be back to fight B.J.’s descendants. Implicitly meaning one or more version of “Doomguy”. B.J. Blazkowicz appears to be a redoubtable commando/military intelligence field agent. He’s highly determined, and a highly skilled instinctive shooter (or at least the enemies have large hit boxes ). One assumes that he’s skilled at stealth and speaks fluent German. Unlike other video game action heroes, B.J. and most of his opponents can only take a few bullets before dying. See the “Genre emulation” section in the game stats for a technical discussion of this. But though he’s made of mere flesh, Blazkowicz possesses superb endurance allowing to withstand torture, massive stress and hours of combat and violent exertion. Blazkowicz is apparently specially trained to take out military dogs. Thus, he can confidently take on a ferocious German shepherd with just his knife to save his ammunition. He is also remarkably proficient at spotting secret doors (secret doors being apparently a hobby of Nazi architects) because I have level maps on my laptop nearby as I play. In the games, B.J. moves in an awkward manner, and turning on himself is oddly slow. Since that’s an important part of the gameplay, we’ll hazard a No-Prize Hypothesis . In both games, he’s been recently wounded and that limits his movements. Perhaps his back is damaged. Blazkowicz is usually armed with a MP40 9x19mm submachinegun, back then oddly nicknamed the “Schmeisser” by American troopers. When necessary he can escalate to an odd prototype Nazi weapon. This is a 9mm minigun that’s about the size of a large assault rifle. This so-called chaingun eats through too much ammunition to be his default gun, though. He also carries a boot knife and a P38 pistol. But these are seldom used if the trusty Schmeisser is available. Blazkowicz may have other skills such as parachuting, vehicular skills, speaking Polish and perhaps other languages, radio operation, demolition, etc.. It is impossible to say. The game was released on DOS in 1992 (with “256-color VGA graphics that animate faster than a motion picture”), so the gameplay is very limited. Verdade, the game is so old that calling the hero “B.J.” was fine. Blazkowicz doesn’t seem to have any problem operating deep in enemy territory, and can be counted upon to find his way to secret Nazi fortresses in Germany. One can imagine many hypotheses. He knows an anti-Nazi network in Germany, he’s an expert forger of Nazi documents, he’s a German elite commando who faked his death and defected to the US during the late 1930s, etc.. But how he does it is unrevealed. The 1980s Wolfenstein games can no longer be played by most (though IIRC there was a DOS version at some point). And they are understood to be out of continuity from the point of view of later games. Thus we won’t discuss them here. 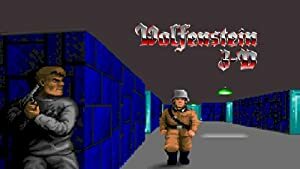 The 1992 Wolfenstein games (Wolfenstein 3D with all Episodes and Spear of Destiny with the Mission Packs) are still widely available and playable. They are usually packaged with a DOSBox emulator. They form a somewhat coherent continuity, but it conflicts with that of later games on several points. The gameplay was also much more constrained than games that came during later decades. This impacts the character’s game stats. Therefore, we’ll treat these games as a separate continuity. For what it’s worth the first episode of W3D was redone in 1992 as a free game called Wolfram . Our in-game screenshots for this entry actually come from Wolfram to avoid the big pixels purée aspect of the vintage game. Later games are, accordingly, covered in other writeups. Early on, the world is apparently identical to the real world in the 1940s. The only oddity are the 9mm “chainguns” used by elite Nazi agents. These resemble no real weapon. But beyond this bit, the Allied intelligence doesn’t expect the Reich to actually have “weird science” technology or magic. It seems that the weird stuff was chiefly discovered by Blazkowicz. His superiors apparently had difficulties believing his reports – though they still entrusted him with key missions. In the Wolfenstein 3D setting, all the stuff about Hitler’s obsession with the occult and it shaping the National-Socialist movement is true. The W3D version of Adolf Hitler sees himself as a messianic figure, destined to be the Second Coming in Christian theology. Or at least his view thereof. This is mixed with heteroclite beliefs about occultism, magic and presumably pseudo-old Norse themes. Thus, the self-proclaimed Messiah collects Christian relics. In particular he’s after the Spear of Destiny that stabbed Christ’s flank in the Bible. In the W3D world, the Spear’s existence is verified. It is a relic rather than a myth. This symbolic weapon has an history of having been wielded by Prussia’s and Germany’s greatest conquerors until the defeat of 1918. Captured and displayed in a Versailles museum, the Spear of Destiny was a key objective of the 1940 Nazi onslaught against France. At this point, it is still assumed by most that Mr. Hitler is just a kook. However, another significant actor in the W3D’s version of history is Dr. Schabbs , the “minister of the macabre”. Albeit he’s considered a charlatan outside of Germany, Schabbs holds actual occult power. Thus, he can actually do awful things using the Spear. This includes reanimating the dead. 9x19mm man-portable miniguns with a 100-round magazine. Large pistols shooting micro-rockets with an HE warhead. Mutated undead soldiers with three arms and great speed, ferocity and endurance. Ferocious mutated giant bats equipped with special firearms. Metallic full body armour for special enforcers, though wearing those requires a person with a humongous physique and physical conditioning. Possibly some rough cybernetic enhancements, probably to bolster crippled elite soldiers. Experimental treatments turning some elite soldiers into berserkers who ignore pain (as with “Submarine Willy”, whom I assume is a former U-boat officer named Wilhelm). Infantry robots not unlike the G.I. Robot over at DC Comics. Devilish secret bases confusing hapless intruders because everywhere looks the same. During WWII, American military intelligence ace “B.J.” Blazkowicz repeatedly infiltrated Nazi Germany on high-stake solo missions. He was apparently the MVP of Allied intelligence services, capable of peerless exploits. This assumes that the Nocturnal Missions pack is the one happening first, though that isn’t clear. B.J.’s first playable mission was to assassinate Nazi scientist Dr. Otto Giftmacher (“the poisonmaker”, presumably a code name). He was successful, but that didn’t stop der Giftmacher’s extensive chemical warfare project. Thus, B.J. had to fight on in the Erlangen research complex. Still on his own, B.J. then invaded the base of the general in charge of actually deploying Giftmacher’s special weapons, and killed him. Both this general and the poisonmaker were armed with special rocket-launching pistols. During the fighting at Erlangen, Blazkowicz had his first encounter with one of the towering members of the Grösse family. Hans, Trans and Gretel Grösse all served as elite enforcers for the Nazi military. They were outfitted with full body armour and wielding chainguns. B.J. would eventually kill all three siblings. Blazkowicz was then sent to steal the Spear of Destiny, held in a Nazi medieval fortress in Nuremberg. Though neither he nor Allied Headquarters believed in magic, they thought that it psychologically bolstered der Führer and/or was making him crazier. Murdering Dr. Schabbs and stealing the Spear would also be important propaganda victories. The indefatigable B.J. made it within the Nuremberg castle, sneaking in using tunnels that led to the sub-basement. Much gunfire ensued. During this mission B.J. ran into three-armed, mutated, savage and apparently undead men who posed a grave danger. These seemed to be dead American soldiers reanimated by Dr. Schabbs. When Blazkowicz found the spear, he was teleported to some sort of netherworld populated by predatory ghosts. A demonic creature claiming to be the Angel of Death attempted to kill him. Once the commando ace defeated it, the Angel declared him worthy of wielding the Spear. Apparently, Blazkowicz didn’t mention this paranormal episode in his report. One assumes that he mentioned the mutated undead, but was met with vast scepticism. Six weeks later a Nazi commando led by Hans “the Axe” von Schlieffen attacked the US. He recaptured the Spear of Destiny and absconded with it. Von Schlieffen was seemingly a super-soldier though only Blazkowicz, who had seen Schabbs’ handiwork and the Grösse enforcers, could draw parallels. The Spear was hidden in a Scandinavian fortified submarine base, which B.J. invaded. There, among other perils, he ran into super-scientist Dr. Quarkblitz. Quarkblitz had mutated bats into giant, highly aggressive, intelligent specimen that he each equipped with a pair of guns. Aside from these deadly monsters, he had also built a heavily-armed combat robot. Blazkowicz nevertheless defeated these bizarre threats and The Axe. But when he found the Spear B.J. again was transported to an otherworldly dimension to prove his worth. Hitler then made a pact with the demon Abigor, who could tell him about the secret of war and the future – perhaps Abigor previously had a similar deal with Quarkblitz. The Führer recaptured the Spear of Destiny, perhaps using magic. He hid it under Berlin in a special base. B.J. was once again sent in, and recaptured the artefact. Allied Intelligence later got wind of something called Operation Eisenfaust. According to the rumours, Eisenfaust was Dr. Schabbs building an army of undead soldiers. Though the intelligence services thought that it was hogwash, it did match B.J.’s previous experience with Schabbs’ research. Blazkowicz was thus sent to the Castle Höllenhammer fortress to steal documents about Operation Eisenfaust. However, he was captured and taken to the Castle Wolfenstein prison. B.J. catches a glimpse of himself in a mirror in the Wolfram remake. Blazkowicz was tortured for 12 days by the SS. When he faked cracking, he was looking in bad enough shape that his guard was lured into his cell. The commando ace promptly killed him, took his weapons and proceeded to escape. As it turned out, that was the tipping point of World War Two. B.J. escaped, killing the last Grösse brother – then reached Castle Höllenhammer where he finally encountered Dr. Schabbs. 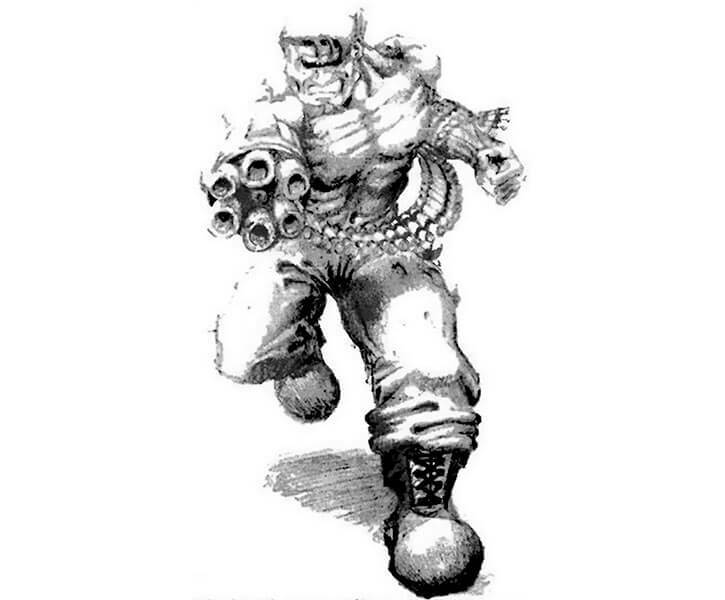 Though the madman was protected by his undead mutants and appeared to be possessed by a demon giving him immense strength and endurance, Blazkowicz did kill him. This eliminated the source of most Nazi paranormal assets. B.J. then cornered the Führer himself in his secret Berlin base. Though armed both with occult powers (allowing him to conjure fireball-hurling demon spectres bearing his moustached face) and advanced weaponry (a heavily-armed power armour suit) Adolf Hitler was ultimately killed. In much of the promotional material, Blazkowicz is drawn as a champion bodybuilder. This may just be artistic licence based on then-dominant aesthetics (for instance 1991 saw Schwarzenegger’s Terminator 2, and van Damme’s Double Impact and Lionheart). But from his in-game portrait B.J. does seem to be a corn-fed, beefy strongman type. Being musclebound would help explain why he turns so slowly, though. So. Slowly. “Bad boy of espionage and terminal action seeker”, or so the manual tells us. And this is all we know about this great figure of history. His mentality is practically machine-like as he personally and methodically brings down an enemy empire. He presumably is a firm believer in the war effort, and perhaps a fierce patriot. Martial Artist only vs. dogs. Area Knowledge (Nazi Germany), Familiarity (Allied military equipment and protocols), Iron Nerves, Languages (German), Schtick (Pain Management (Low), Sweeping Autofire) and perhaps Genre-specific Schticks (Straight Shooter, Bad Enough Dude) – see below. MPR (his wounds make turning around slow). German boot knife [BODY 04, EV 03 (04 w/STR, 05 vs. dogs)]. Walther P38 [BODY 03, Projectile weapons: 04, Ammo: 8 bullets (see below), R#02]. MP40 Submachinegun [BODY 04, Projectile weapons: 05, Ammo: 32 bullets (see below), R#02, Advantage : Autofire]. Nazi 9mm chaingun [BODY 04, Projectile weapons: 06, Ammo: 99 bullets (see below), 02, Advantage: Autofire]. These game stats assume the default difficulty level (“Bring it on!”), which also corresponds to the Real Genre. 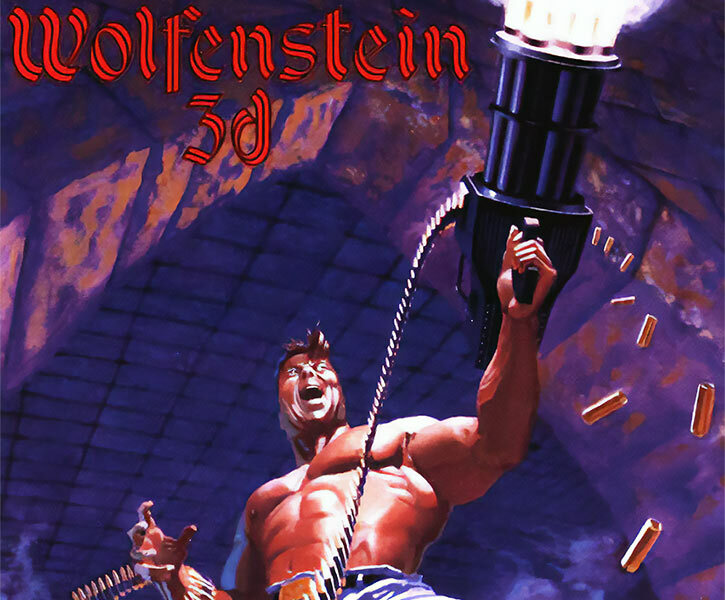 Wolfenstein 3D was different from many modern schmups (“shoot ’em up” video games) in that the protagonist and run-of-the-mill opponents had few “hit points” and thus could be easily shot dead. They do assume a skilled player though, hence the hero’s good OV (from DEX) and Initiative. We assume a skilled player since there weren’t too many games like this back then, so you’d get to practice playing Wolfenstein a lot. Playing Wolfenstein 3D involves running over food (to replenish) health, having multiple lives (three at the beginning) and running over treasure (to gain experience that unlocks additional lives). These are clearly early video game conceits à la Pac Man, and feel even more forced than in Doom. Worldwide area of consequence (15). So that’s 50 points per level, which in the Real Genre might be required especially for levels with Officers, Mutants, Bats, etc. (never mind bosses). B.J. can blow most of his HPs to do the level then refill, accruing some savings for the boss levels. This reinforces the conceit that he wins more on HPs than on stats. Mind, his stats are fairly good. But without HPs a bad encounter with a lowly guard could leave B.J. badly wounded, just like in the game. Range is an important consideration in Wolfenstein 3D, as enemy firepower decreases with distance. Being shot point blank is *much* more serious than being hit from a long range. We strongly suggest using the optional rules in BOH:SE page 156 (“Distance penalties” boxed section within the M- THROWING THINGS section), though in the Wolfenstein Genre the penalty-free distance is 2 APs rather than 4. See our New Rules – Miscellany article for more. If you do so, B.J. has a Schtick (let’s call it Straight Shooter). It bumps the penalty-free distance back to 4 APs, encouraging range management like in the video game. Another important mechanism is flinching. Enemies that get hit cannot attack for a brief time as they flinch in pain. 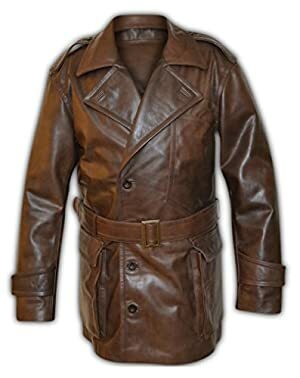 Exploiting this is an important edge for Blazkowicz. A simple rule would be to lower the final die roll for attacks by one for every RAP taken this Phase. If such a rule is adopted, B.J. has a Schtick (let’s call it Bad Enough Dude) that negates this effect. So do most “boss” opponents, though. Ammunition conservation is another important aspect of gameplay. All weapons use 9x19mm ammunition. Attacking with the Walther costs 1 bullet per target, with the MP40 three bullets per target, and with the chaingun five bullets per target (“per target” to reflect the possibility of Multi-Attacks). Most guards will “drop” but four rounds when killed. – Yeah, I play next to my laptop displaying the level’s secrets, so what — Enhanced Trait (Perception 4, Limited 1 to spotting secret doors). Strength-Based Damage 1, Limited 1 to attacks against dogs. Chokehold, Close Attack 2, Defensive Roll 2, Improved Aim, Improved Defense, Precise Attack 1 (Cover), Quick Draw, Ranged Attacks 3. Fearless, Great Endurance, Language (German). Athletics 1 (+3), Close combat (Knives) 1 (+6), Deception 5 (+6), Expertise (Commando) 10 (+12), Expertise (Nazi Germany) 8 (+10), Insight 2 (+3), Perception 3 (+4), Persuasion 1 (+2), Ranged combat (Firearms) 3 (+9), Stealth 4 (+5). Terminal action seeker Blazkowicz receives the most hideously dangerous commando missions there is, and works alone. Wounded back ? Perhaps due to wounds, Blazkowicz takes more time than most to turn around or pivot on himself. Trade-off areas. Attack/Effect PL 7, Dodge/Toughness PL 5, Parry/Toughness PL 5, Fort/Will PL 7. Points total 84. Abilities 30, Defences 18, Skills 19, Powers 2, Devices 0, Advantages 15. Equiv. PL 6. B.J. might have the following Skills – it would make sense, but the limited gameplay of the vintage games leaves no room for these. Additional ranks of Athletics (probably Limited to the climbing application), Ransk of Intimidation, a few Ranks of Treatment, and vehicular skills (likely Limited to land vehicles, but not necessarily). By the same token, additional Advantages, etc. are entirely possible. The gameplay was really limited, for obvious reasons. We have assumed a/ reasonable stats for B.J., b/ that his real edge is Hero Points and that c/ the extra lives, treasures/experience, and food in W3D levels correspond to generous Hero Point awards at the end of *every* game level. Three HPs for Mr. Blazkowicz at the end of each level wouldn’t be unreasonable. Source of Character: Wolfenstein 3D (including the Spear of Destiny pack and other additional missions). Helper(s): Darci, Dr. Peter Piispanen, Kevin Berger, Roy Cowan. Writeup completed on the 20th of April, 2015.